Wang Guangyi was born in 1957 in Harbin, the capital of Heilongjiang Province. He graduated in 1984 from the Department of Oil Painting at the China Academy of Fine Arts, Zhejiang branch. In the later 1980s he was one of the “founding” members of the Northern Art Group, a circle of Chinese avant-garde artists with similar interests and similar understanding of art. Wang Guangyi is one of the most recognizable figures on today’s contemporary art stage, globally renowned for his combination of avant-garde art and impressive commercial success. This contrast should come as no surprise, as he encourages the recognition of such contradictions. 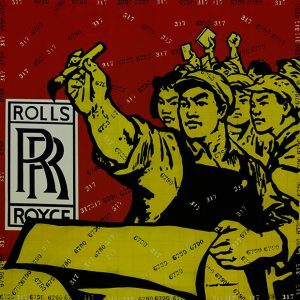 Wang’s art embraces seemingly antithetical elements—Pop with Tao, communism with capitalism, Christ with Mao—in order to transcend differences and “rationally” analyze their interrelations. Nowadays, Wang enjoys rock-star status, with all the expected fanfare, material wealth and comforts. He looks the part too: long hair, scruffy beard, a leather jacket and a ubiquitous cigar in his mouth. Wang Guangyi does not only receive hails from art critics and the press, but also some criticism. Somehow he seems to stand between the lines, just like his Great Criticism painting series is standing between two very different periods of Chinese history. 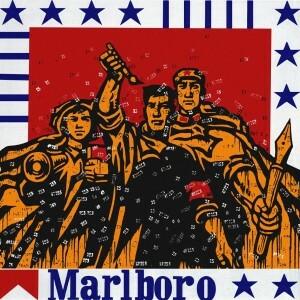 On the other side of the political spectrum there are people who see in Wang Guangyi an artist who adamantly condemns Western culture and commercialism and uses the energetic power of the old socialist role models for a call back to China’s old idealism and virtues.